This is a follow up to last year's post on "The Adoptables" project, launched by PetRescue in the lead-up to tax time 2016. See also: Why PetRescue’s new system will spell the end for growth in mid-sized rescue groups. 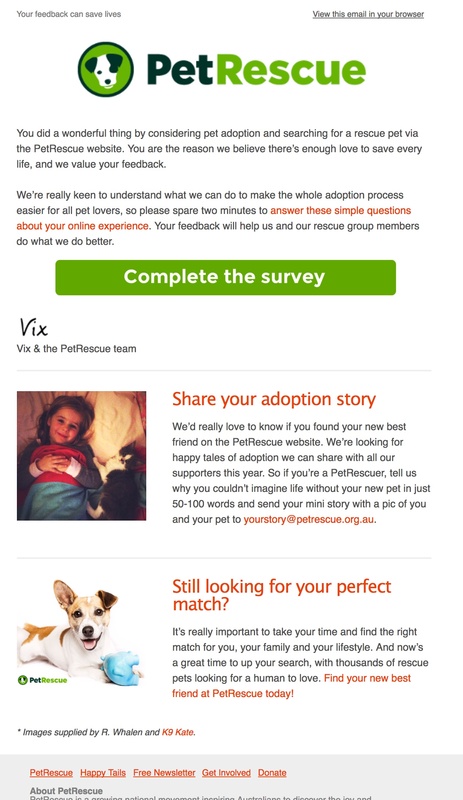 PetRescue has a sophisticated communications strategy called ‘on-boarding’ - which starts the moment a potential adopter makes first contact with a rescue group via the website. That is, every single application made through the PetRescue website, to a rescue group, becomes a donation solicitation. Every single one. As soon as that first connection is made, PetRescue will gently start communicating with this potential adopter. This introduction email goes to all potential adopters who send an application through the website. It reaches them, in the overwhelming majority of cases, before they've had a chance to hear back from a rescue group. By mentioning that there is a benefit to seeking out a "good" rescue group, it also positions in the mind of applicants the existence of "bad" rescue groups. Don't trust just anyone. Again, this email would often have gone out, often, before a response from a rescue group has been received. 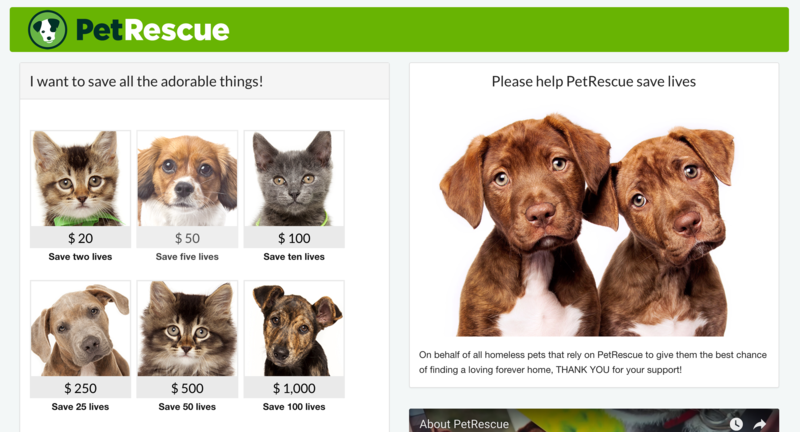 It positions PetRescue as "more than just a website" and as a "non-profit" helping "pets in need". Again, this email is still less than a fortnight after the first application. Maybe a rescue group has stepped in and have started the process of an adoption - or in many cases certainly, the applicant is still 'shopping around' for a pet. But one thing is very consistent through this entire process - the repetition of the PetRescue brand, and repeated and strategic contact by the PetRescue organisation. Every day, thousands of pets are counting on us to find them a forever home. We know you can't take them all home, but you can help us keep saving lives. It costs just $10 to match one of our rescue pets with their new family. Donate now. So while rescue is busy saving and caring for pets, PetRescue is quietly and smoothly taking credit for those rescues. And when people click through to donate, this message is absolutely confirmed... "...help PetRescue save lives"
PetRescue uses this email to invite applicants who were successful - adopters - to start engaging with them, sharing stories that they can use in their promotions. But probably more importantly, it invites adopters to make themselves known, so they can be targeted for further solicitations. 09/02/2017 - Did someone say cake? 05/18/2017 - Have kids? Have fur kids? Want to adopt? 03/02/2017 - We want you as a furry recruit! How does a rescue's brand compete? "The Adoptables" is designed to convincing the public that a donation to PetRescue is equal, or even superior to, a donation to a rescue group. It is being combined with a regular, strategic and consistent communications which starts at the moment of the very first application. A strategy so resource intensive that very few rescues could hope to compete. With "The Matchmakers" project being launched soon - increasing their access to the details of adopters at point of adoption - it is a certainty that PetRescue will build on their national brand, and teams of rescue groups inadvertently doing donor outreach on their behalf. Rescue will keep doing the work, while PetRescue profits.